TigerChef Silver Stainless Steel Soup Warmer 10.5 Qt. TigerChef > Restaurant Equipment > Food Warming and Holding Equipment > Commercial Food Warmers >< Soup Kettles > TigerChef Silver Stainless Steel Soup Warmer 10.5 Qt. $68.55 Winco ESW-66 Electric Soup Warmer 10-1/2 Qt. $734.52 Vollrath 7203102 Twin Well Soup Merchandiser Base with Menu Board and Tuscan Graphics 7 Qt. $734.52 Vollrath 7203103 Twin Well Soup Merchandiser Base with Menu Board and Country Kitchen Graphics 7 Qt. $66.99 Thunder Group SEJ30000C Black Stainless Steel Soup Warmer 10-1/2 Qt. $66.99 Thunder Group SEJ31000C Silver Stainless Steel Soup Warmer 10-1/2 Qt. $66.99 Thunder Group SEJ32000C Brown Stainless Steel Soup Warmer 10-1/2 Qt. $153.85 Omcan (FMA) 19074 Commercial Stainless Steel Soup Kettle 10.6 Qt. The TigerChef Silver Stainless Steel Soup Warmer 10.5 Qt. is a must-have in any restaurant or catered event. Featuring a temperature control dial, this soup warmer efficiently keeps soup and sauces at the perfect temperature and ready to serve. 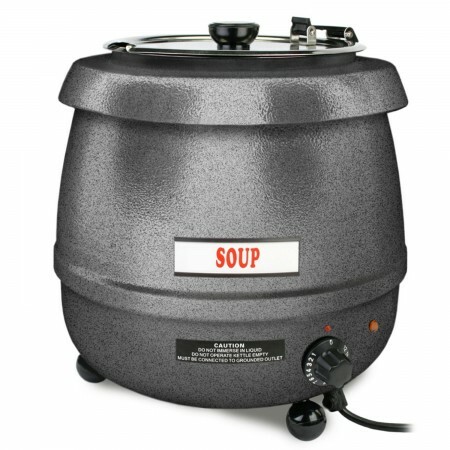 Made from stainless steel, this rust-resistant soup warmer will withstand heavy duty use without warping. Thanks to its hinged lid, this soup warmer seals in heat while its label lets your guests know what's inside without lifting the cover. Dimensions: 13" x 13" x 15"